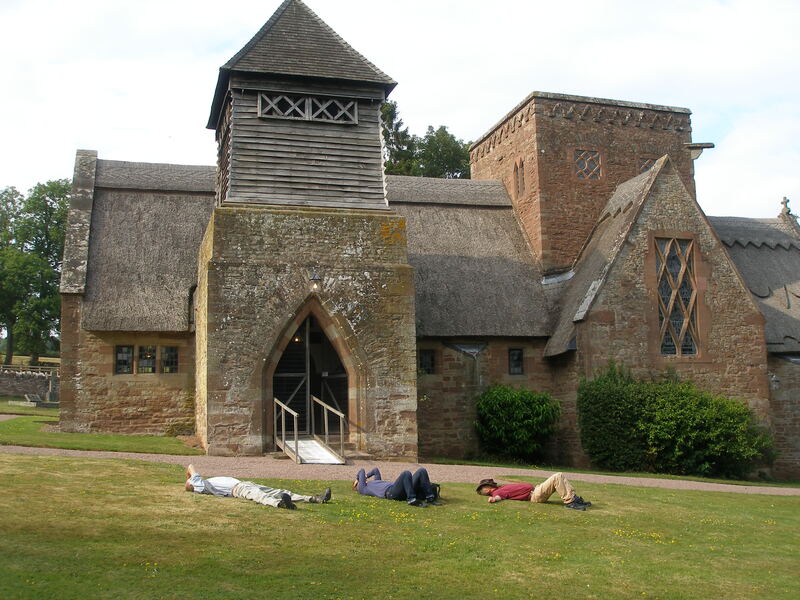 Brockhampton Church: Fracking near here!? Little did I realise when I wrote my previous blog on ‘fracking and values’ that within a couple of days of posting it the Hereford Times would carry the story that fracking may come to us in Herefordshire. Fracking is bad technology wherever it is. The Herefordshire villages of Fownhope, Eastnor and Much Marcle are all beautiful places, with rich agricultural land, some tourism and much to lose as a result of these destructive proposals. The work so far is only exploratory, no planning permission has yet been applied for, but the local community are already getting organised in opposition. Meanwhile the UK government is also pushing ahead with Hinkley C nuclear power station at tremendous cost to the UK taxpayer; this, at a time when the full scale of the nuclear leak at Fukushima is only now becoming apparent. Both nuclear and fracking are obsolete, expensive and polluting technologies. Solar power by contrast is undergoing a long term and continuing fall both in cost and in the environmental footprint associated with many of the individual technologies such as concentrating thermal, concentrating photovoltaic and ordinary photovoltaic panels. The Californian energy and entrepreneurial expert Tony Seba shows how unit costs of pv have fallen 1000 fold relative to nuclear over the last 40 years, and forecasts it won’t be long before they have fallen 10,000 times. Of course solar will not meet all UK energy needs, although it will for many currently off grid regions of India, Africa and Latin America. The UK could follow the lead set by Germany, Denmark, Sweden and Uruguay and many other countries and start a process to move toward 100% renewables. We have some of the best wind resource in the world, excellent tidal and wave energy potential, vast potential for renewable gases and liquid fuels generated via algal bioreactors, anaerobic digesters and a basket of other emerging renewable technologies. Perhaps the greatest opportunity is through greater levels of energy efficiency in terms of how we build, travel, farm and live. We can live better, pollute less, have more fun and build a fairer world by transforming our relationship to energy, both our personal energy and the energy we use in our lives. I’m about to start a course of evening classes in Leominster where we’ll be exploring all this from a local, Leominster perspective. The class is called ‘Leominster: Radical Possibilities for a Sustainable Future’, perhaps it should be a ‘Leominster: Radical Possibilities for a Better Future’, but they are in the end one and the same thing. My report ‘Localising Herefordshire’s Energy Economy’ is available as a free download on this blog site under writings, and there is more about my upcoming Leominster evening classes on the talks and classes page of this website. This entry was posted in Energy, Environmental, Evening Class, Local on 3 September 2013 by Richard. The evening classes are all up and running, in Ledbury, Hereford and Kington. All three groups are quite different. 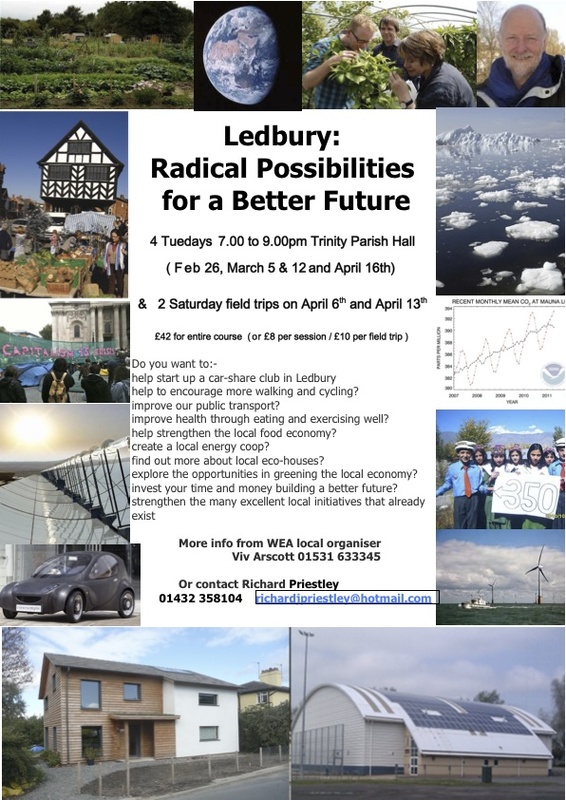 The Ledbury group is organised by the Workers Education Association and meets in a very comfortable and well equipped church hall, in Kington we are just a very small group meeting in a large room in a pub, and in Hereford we have the biggest group meeting in the smallest venue, the Rocket Café. All the promotion and publicity are over, which is the bit I don’t much like. Presenting my material and meeting and hearing the ideas and views of the diverse range of people who come along to these classes is the bit I love. Hopefully out of these classes may come practical projects to increase our community response to problems like climate change and peak oil, such as new community owned renewable energy projects like the Leominster Solar Roof I wrote about on this blog in December. Also we should all learn about some of the utterly amazing and positive things that are going on in all countries on Earth, which seldom get mentioned in the media, and which can give us inspiration, hope and renewed enthusiasm and commitment to engage in the struggle to help create a better future. It’s early days and it’ll be really exciting to see how the three groups evolve over the next seven weeks. Meanwhile several people have been in touch about the possibility of me running these classes in other locations starting in September. So far the most likely look like being Malvern, Monmouth and Shrewsbury. If you live in any of these places, or elsewhere and are interested in me running these classes, or giving one-off talks in your area, do please get in touch via this website. This entry was posted in Evening Class, Local on 31 January 2012 by Richard. A couple of nights ago I gave a talk and slide show at the Talbot Hotel in Leominster, Herefordshire. It was organised by Leominster Civic Society and I was called in at the last minute because their planned speaker was suddenly unavailable. I put together a talk about the Herefordshire Local Development Framework document and how we could improve it by learning from some inspirational examples of global best practice in terms of Co2 reduction and a diverse range of other benefits. Throughout the document Herefordshire Council use the term “Sustainable Economic Growth” without ever properly defining it. Many of the places I have written about in this blog over the last year have made dramatic Co2 reductions while seeing rapid economic growth as they develop various forms of renewable energy. Gussing in Austria made a 93% Co2 reduction while creating a thousand new jobs; not bad for a small town of 4,000 people. There is much for Herefordshire to learn. What I love about these evenings is the opportunity to present the examples that inspire me that a better, more ecologically sustainable and socially just future is possible, but also the many points that arise out of the discussion that always follow these talks. I hear about new ideas, projects, technologies and developments to use in future talks. I have had criticism that just talking doesn’t change anything. This week I heard otherwise: Last year I showed a slide and talked about carbon negative cements such as Novacem and Calera and someone in the group who’d not heard of this before was about to write a document where he now specified that the contractors were to source the lowest carbon cements available, which they have now done. Result! Also after the Leominster talk there was a lot of networking going on about how some innovative and ecologically restorative land use ideas might be practically developed by a couple of members who owned land. Exciting stuff. This entry was posted in Evening Class on 11 November 2010 by Richard.